And cloudy it has been. The ongoing anti-Fall protest continues with a sunny bright manicure. It's a little something but nothing too fancy or special. I've got some major projects to amp up for, so I'm savoring these days of simple nail art in the meantime. There's only three colors and a dotting tool involved tonight. Once in a Blue Mousse (Lime Crime), My Boyfriend Scales Walls (OPI) and The "It" Color (OPI). This is SOO cute I'm in love!! The colour choices are seriously perfect!! 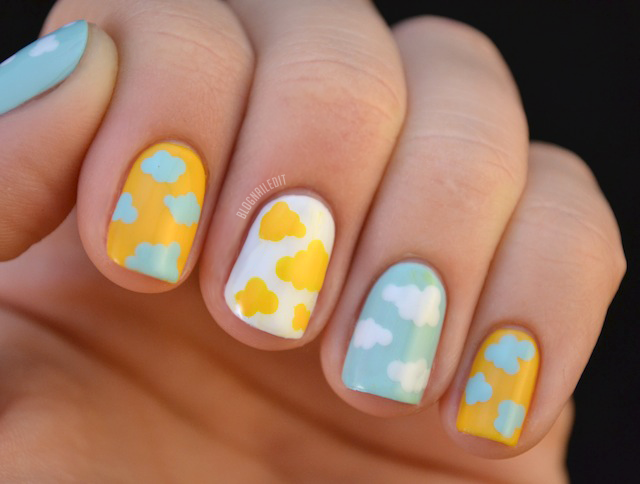 I think you could have made tri-colour cloud manis a "thing", at least with me! LOL It matches your blog so well too! Very cute. I am usually not one for cute but this I think I have to try! Aw, it's such a fun mani ^_^ . I love this! It's so pretty :) I would totally try something like this if I had the time! this is so adorabale! so gorgeous! OMG...this is completely adorable. I love what you did with the colors! I may have to copycat this mani! I love it!!! So simple and cute!!! What a cute and fun design! Those yellow clouds are definitely happy! Very cute!